A passion for the perfect guitar — time after time. The Kepma story begins like a typical music products company story – a visionary or two identify a problem or unfulfilled need in the market and design a pathway to solve the problem and fulfill the need. Simple enough. In Kepma’s case, the problem in the marketplace was (and is) the abundance of bad and mediocre mass produced guitars with no quality assurance process, no standard of excellence in manufacturing methods, and frankly, no soul whatsoever. Meet Jack and Kevin. Two guys with a passion for music, a love of the guitar and a fascination with making things better. Jack Peng & Kevin Liu have known each other since grade school. They grew up in environments where music was part of the family fabric and they taught themselves to play guitar on the simplest made instruments they were able to afford. Fast forward to their University years, where they both studied mechanical engineering, and after graduating, they concluded that something needed to be done about the quality of guitars that were being made. That’s when they decided they would work together to develop manufacturing techniques and processes that would produce the best instruments on the face of the planet. While previously working for OEM guitar factories, they saw firsthand that most imported guitars don't sound very good or play very well. They witnessed famous American names being screened onto headstocks the same way a furniture factory makes the same table over and over; without passion and with parts that are made "good enough". They saw inconsistencies in quality, workmanship, sound and playability. And they knew there was another way. A better way. So in 2009, armed with startup funding from some supportive college friends, the Kepma Guitar Company was born. Jack and Kevin invested in high tech machinery including an array of CNC machines to cut, mill and fabricate consistent components of their first guitar design, the A1, combined with the perfect balance of skilled and trained craftsman. The word of the Kepma quality quickly spread throughout the country and by 2015, Kepma was the number one acoustic guitar brand in all of China. * Read that again. “Kepma was the number one acoustic guitar brand in all of China.” In a country of nearly 1.4 Billion people, that’s quite a feat. As the company sales grew, Jack and Kevin were continuing to explore all facets of guitar making. Their engineering minds and fascination with famous makers from around the world led them on a quest to create a premium product using their philosophy of making one product and making it perfect each time. With Kepma's stronghold on the domestic market for the popular range of guitars, they then set their sites to a new premium standard called the Elite Series. While most manufacturers were involved in a "race to the bottom", Jack and Kevin saw an opportunity to satisfy players that were looking for a real instrument that would be a real tool for the trade. A guitar series with all the construction and tone standards of premium makers but at a mass produced price. Kepma started consulting with legendary American luthiers and world-famous guitar builders that, due to confidentiality agreements, we cannot mention here. But their work is renowned for guitars costing tens of thousands of dollars and are available to only a select few collectors and artists. Their hand creations are verified by audio spectrum analysis and modal simulation — proof that guitar making should be (and now is) a combination of high-level science and art. Every Kepma Elite Guitar solid spruce top is completely evaluated and graded for frequency response, tap-tuned and tapered to produce the perfect sounding solid top - perfect. Every time. The new premium guitar would also take their production to a new, unrivaled level. In addition to adding more custom computer-controlled machines, the new guitar would be produced using more precision automation and robotics than ever before – including in-house manufactured custom machinery built specifically for new methods of construction. Every Kepma Elite Guitar is manufactured using the most advanced laser and CNC machines and robotic equipment making them the precisely crafted to tolerances of .001". Kepma Elite Guitars are Perfect - Every time. Multiple German precision Plek machines not only perform precise fret dressing but also assists in quality control and R&D. Kepma was (and is) the first manufacturer in China to employ Plek technology. The combination of precision CNC routing and machining of the neck components, the dual carbon fiber rods and two-way truss rod for strength and fine adjustment ability, and the ultimate finishing of the fretboard and neck with Plek® make every Kepma Elite Guitar Neck perfect - every time. Each guitar is subject to 300 hours of vibration that provides curing and loosening of the wood. This artificial aging process means your new Kepma sounds vintage the first time you open the case. Every Kepma Elite Guitar is subjected to 300 hours of vibration to "age" the instrument. This is the equivalent of "breaking in" a guitar by playing it every day for just over a year. 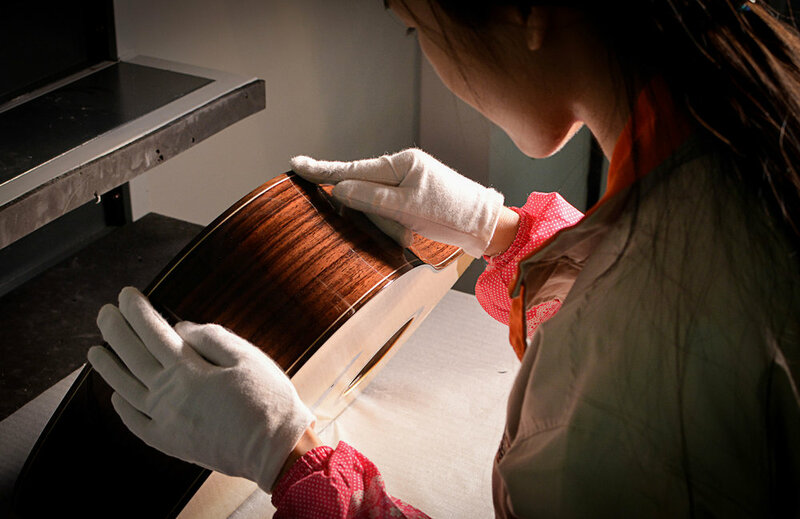 This process ensures that every Kepma Elite Guitar is perfect - Every time. Shell inlay from New Zealand. Sitka spruce from Alaska. Rich ebony from Africa. Cites certified rosewood from India. Just examples of the raw materials from over 10 countries that go into making each Kepma Elite Series guitar. All sources are verified and documented to qualify to Kepma standards of sustainable, renewable resources that leave zero negative impact on the environment while creating huge impact in the artist community. Kepma Elite guitars are constructed and assembled using the latest machine technology from the USA, Italy, Germany, Japan and China coupled with a highly skilled and motivated workforce. Kepma Elite Guitars truly are "global" instruments utilizing the best of the best — NOT the best of what's "locally" available. Nuts and saddles from GraphTech labs, pickup systems from some of the world's best thinkers in acoustic sound reproduction, Fishman, L.R. Baggs and Double — just a few of our trusted and proven suppliers that make every Kepma Elite the best it can be. So, what does all this mean to you, the player? This means that when you buy a Kepma Elite Series Instrument, you’re getting an instrument that rivals the quality, sound, playability and build of some of the world's most expensive brands at an unparalleled value. Kepma Guitars has been building instruments now for over 10 years, and the with the introduction of the Elite series brings to players a new paradigm in high-end guitars —exacting tolerances and standards, extremely high-quality build and finish, unparalleled tonal response, unmatched creativity and innovation in electronics. Put a Kepma in your hands and your imagination runs wild. High-end, quality inspired instruments — that’s the Kepma difference. Now you know!